Protesters descend on the electorate office of NSW Deputy Premier John Barilaro in Queanbeyan after walking all the way from Sydney. Feral horse protesters converged on NSW deputy premier John Barilaro’s office in Queanbeyan today in opposition to the protection of destructive feral horses in Kosciuszko National Park. They were joined by the ‘Save Kosci’ walkers who marched all the way from Sydney on their way to Mt Kosciuszko in protest at new laws that protect feral horses in Kosciuszko National Park at the expense of the park’s conservation values. The protesters called on John Barilaro and his government to repeal the Kosciuszko Wild Horse Heritage Act 2018 and protect Kosciuszko National Park from destructive feral horses. Reclaim Kosci campaign coordinator Richard Swain said the deputy premier’s ‘brumby heritage act’ prioritises a feral animal over the protection of native plants and animals in Kosciuszko National Park. “The government is ignoring science and putting at risk Kosciuszko National Park’s fragile ecosystems and vulnerable native species by protecting destructive feral horses in the park,” he said. “Australia’s alpine plants and animals did not evolve with heavy, hard-hoofed animals and many rely on habitats that are now being severely damaged by horses. In both NSW and Victoria, the scientific committees advising the governments on threatened species have concluded that feral horses are a major threat in alpine and sub alpine habitats. “The NSW committee’s preliminary determination found that habitat damage in streams, wetlands and adjacent riparian systems occurs through selective grazing, trampling, track creation, pugging (soil compaction), wallowing, dust bathing leading to stream bank slumping and destruction, stream course disturbance and incision and sphagnum bog and wetland destruction. “This is environmental vandalism and will push threatened and endangered species closer to extinction. 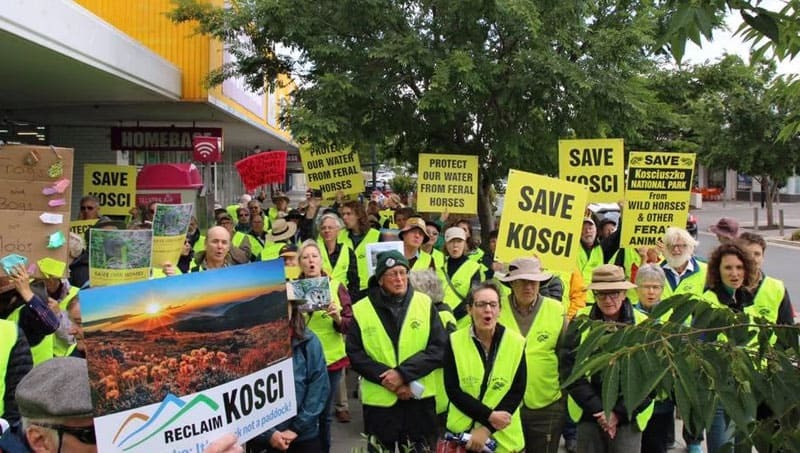 The Save Kosci walkers are supported by the Reclaim Kosci campaign, which seeks to prevent Kosciuszko National Park from being over-run by feral horses.